On Sundays at Friends Center you can find Quakers at worship. Central Philadelphia Meeting has worshiped here since 1856. You will find a community diverse in age and race and sexual orientation each on a unique spiritual journey fostered lovingly by the meeting community. 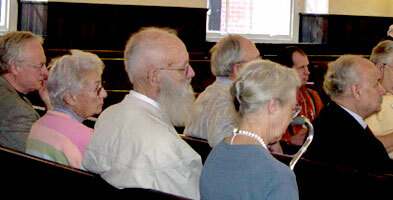 Every Sunday the meeting welcomes visitors who come just to see what a Quaker meeting is like. Worship is held on Sundays at 11:00. Worship at Central Philadelphia Meeting is based in silent waiting on the “still small voice.” (1 Kings 19:12) Each worshiper opens her or his heart to God’s guiding presence. While there is no minister and no prepared sermon, anyone among the worshipers may stand and give a brief message of the workings of the Spirit. Sometimes the entire hour is passed in worshipful silence. To learn more about Central Philadelphia Friends Meeting, click here. To find a Quaker meeting near you, click here.